Nigella Lawson does healthy!! Who would have known? I have a bad habit whenever I’m on a detox (term being used loosely here, don’t ask): I browse food blogs and recipes more often during this time. Not sure if it’s to torture myself or just a subconscious thing. Nevertheless, it has landed me some gems, recipes that I would use over and over again, such as this one. I have always associated Nigella Lawson with luscious cakes, butter-laden hearty dishes, …. more cakes, pies, ie: everything that is not so good for our waistline but oh so good with our tastebuds. But when I saw this recipe, my eyes popped. Granted, it is still a pasta which means carb-heavy, but without the sinful accompaniment of *cough* bacon (although you can naughty this up by adding it) and cream, yet it’s so delightful to eat! I have taken a further step of ensuring the pasta is 100% wheat and omit the cheese to make it vegan friendly. Another thing I could have done is also to use wholemeal pasta, but I’m honestly not a big fan of the texture. Now her recipe actually calls for linguine which, happened to have run out of and chestnut/cremini mushrooms which I cannot find. But the substituted version is still pretty good! I also fried the mushrooms beforehand because I prefer it that way. Otherwise, you can save a step and have them raw which was originally intended in her recipe. 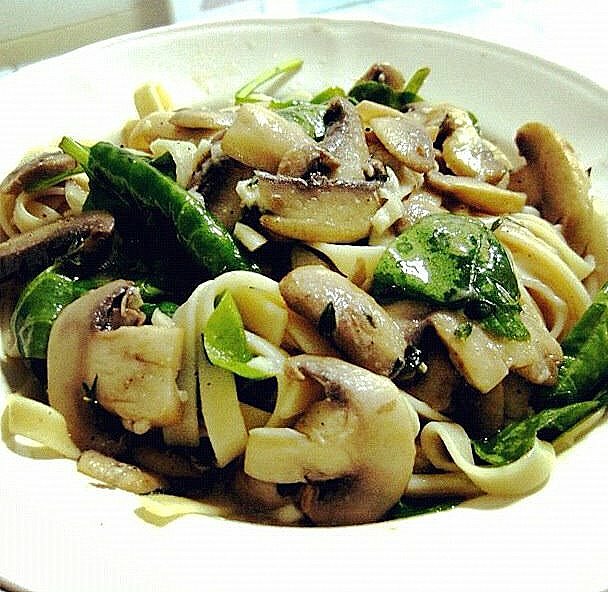 Fettuccine with Lemon, Garlic and Thyme Mushrooms and Spinach. Slice the mushrooms finely, lightly fry in olive oil, and put them into a large bowl with the oil, salt, minced garlic, lemon juice and zest, and gorgeously scented thyme leaves. Cook the pasta according to the packet instructions and drain loosely retaining some water. Quickly put the pasta into the bowl with the mushroom mixture. Toss everything together well, and then add the parsley, cheese and pepper before tossing again. Eat with joy in your heart. Or add chili oil/flakes like I do and slurp it all up! Thank you Nigella, this is simply divine! I’ve already made it the second time just last night, with linguine, swiss brown mushrooms and peas. Go do yourselves a favour and make this, quick!! 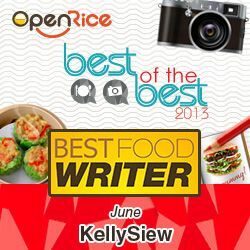 And now I must go get ready for the Time Out Food Awards Party tonight at klpac! What to wear? <– Eternal dilemma of a woman. Ah. The splendid life of being Kelly’s Crash Test Dummy. ..
Hahaha, we’ll make this again next week! I LOVE Nigella and I LOVE pasta. I’ll be giving this one a go, though I’m going to stick with the non-wholemeal pasta because I can’t stand that stuff! I’m sure you’ll like this one! The stent could inserted alongg with balloon catheter. are unquestionably recruited to this surface. You will find RDP Remote Desktop Connection Protocol which can be enabled in Get a handle onn Panel->System->Remote. To reproduce, molds develop small seed-like particles, called spores. simply take to accomplish each area of the house. The model homes are traditionally staffed by a purchase agent. This content located above was discovered on each property builder’s website in November of 2008. These are typical only a few minutes far from Del Valle. In a surrounding you’ll frequently encounter form, which really is a fungus. investment. For that reason then need more care and attention. about your investment. Thus then need more care and attention. and try to acquire the sense of happiness and satisfaction out of each moment. you won’t properly know very well what is expected of you. modifications for your work later. issues and absolutely have a good knowing off this exchange strikes. But what does slander intend in legal labels?